Patios and walkways made from pavers that have been laid in sand are simple to maintain. A damaged paver can be lifted up and replaced or sand can be replaced. Sand sometimes will wash out of the joints between pavers due to heavy rain or wind. It is important to keep the joints filled with sand so that the paver surface remains stable and safe. An unfilled joint could be a tripping hazard. Re-sanding the joints of pavers can be completed as part of your regular yard maintenance. 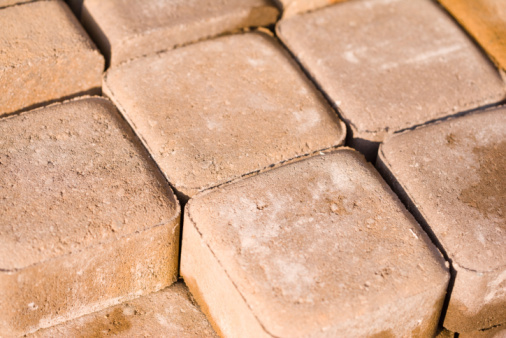 Re-sand your paver joints to keep your patio in good condition. Sweep off the surface of the patio or walkway with a shop broom to remove any dirt or loose debris before adding sand to the joints. This will help prevent pebbles, twigs or leaves from being filled into the joints with the sand. Empty bags of sand on top of the paver surface. Spread the sand out over the surface with a shop broom. Sweep the sand across all of the joints to fill them in completely until all of the joints are filled. If some joints won't stay filled, mist the joint with a spray bottle of water, add sand and mist over the added sand. Sweep off the excess sand with a shop broom. Save the excess sand for later re-sanding of joints in a metal trash can in your shed or garage.